Description: “WORLD HEROES PERFECT” is a fighting game released by SNK in 1995. 16 characters based on historical figures battle it out to decide who is the strongest. New elements such as hero gauge, extra attack, and guard attacks have been added to this version, leading to more exciting matches! This is a list of VGCollect users who have ACA NeoGeo World Heroes Perfect in their Collection. 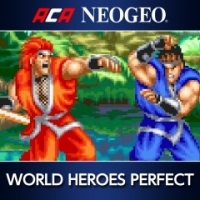 This is a list of VGCollect users who have ACA NeoGeo World Heroes Perfect in their Sell List. This is a list of VGCollect users who have ACA NeoGeo World Heroes Perfect in their Wish List.